RA 2400 ZA S1 (ref 1.0). 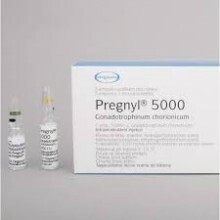 Pregnyl contains human Chorionic Gonadotrophin (hCG) which has luteotrophic (LH) activity. In the female Pregnyl substitutes the endogenous mid-cycle LH surge to induce the final phase of follicular maturation, leading to ovulation. In the male Pregnyl stimulates Leydig cells to promote the production of testosterone. Maximal plasma hCG levels will be reached in males approximately 6 and 16 hours after a single intramuscular or subcutaneous injection of hCG, respectively and in females after approximately 20 hours. HCG is approximately 80 per cent metabolized, predominantly in the kidneys. Intramuscular and subcutaneous administration of hCG were found to be bioequivalent regarding the extent of absorption and the apparent elimination half-lives of approximately 33 hours. On basis of the recommended dose regimens and elimination half-life, cumulation is not expected to occur. Ovulation induction in subfertility due to anovulation or impaired follicle-ripening. Preparation of follicles for puncture in controlled ovarian hyperstimulation programs (for medically assisted reproductive techniques). Hypogonadotrophic hypogonadism. Cases of idiopathic dysspermias have also shown a positive response to gonadotrophins. Cryptorchidism, not due to anatomical obstruction. Hypersensitivity to human gonadotrophins or any of the substances of Pregnyl. Known or suspected androgen-dependent tumours, such as prostatic carcinoma or breast carcinoma in the male. Pregnancy and lactation: Pregnyl may be used for luteal phase support. It must not be used during lactation. In pregnancies occurring after induction of ovulation with gonadotrophic preparations, there is an increased risk of multiplets. Since infertile women undergoing assisted reproduction, and particularly IVF (in vitro fertilisation), often have tubal abnormalities the incidence of ectopic pregnancies might be increased. Early ultrasound confirmation that a pregnancy is intrauterine is therefore important. Rates of pregnancy loss in women undergoing Assisted Reproductive Technologies (ART) are higher than in the normal population. The presence of uncontrolled non-gonadal endocrinopathies (e.g. thyroid, adrenal or pituitary disorders) should be ruled out. In patients treated for subfertility due to anovulation or impaired follicular ripening, the prior administration of an FSH-containing preparation may lead to unwanted ovarian hyperstimulation. Therefore ultrasonic assessment of follicular development and determinations of oestradiol levels should be performed prior to FSH-treatment and at regular intervals during FSH-treatment. Oestradiol levels may rise very rapidly, e.g. more than a daily doubling for two or three consecutive days, and possibly reach excessively high values. The diagnosis of unwanted ovarian hyperstimulation may be confirmed by ultrasound examination. If this unwanted ovarian hyperstimulation occurs (i.e. not as part of a treatment preparing for IVF/ET, GIFT or ICSI), the administration of the FSH-containing preparation should be discontinued immediately. In that case pregnancy should be avoided and Pregnyl must not be given, because the administration of an LH-active gonadotrophin at this stage may induce, in addition to multiple ovulations, the ovarian hyperstimulation syndrome. This warning is particularly important with respect to patients with polycystic ovarian disease. Clinical symptoms of mild ovarian hyperstimulation syndrome are gastro-intestinal problems (pain, nausea and diarrhoea), painful breasts and mild to moderate enlargement of ovaries and ovarian cysts. In rare cases severe ovarian hyperstimulation syndrome occurs, which may be life-threatening. This is characterized by large ovarian cysts (prone to rupture), ascites, weight gain, often hydrothorax and occasionally thrombo-embolic phenomena. Women with generally recognised risk factors for thrombosis, such as a personal or family history, severe obesity (Body Mass Index > 30 kg/m2) or thrombophilia, may have an increased risk of venous or arterial thromboembolic events, during or following treatment with gonadotrophins. In these women the benefits of IVF treatment need to be weighed against the risks. It should be noted, however, that pregnancy itself also carries an increased risk of thrombosis. Patients with latent or overt cardiac failure, renal dysfunction, hypertension, epilepsy or migraine (or a history of these conditions) should be warned and kept under close medical supervision, since aggravation or recurrence may occasionally be induced as a result of increased androgen production. hCG should be used cautiously in prepubertal boys to avoid premature epiphyseal closure or precocious sexual development. Skeletal maturation should be monitored regularly. No interactions of clinical relevance are known. Pregnyl may be used for luteal phase support. It must not be used during lactation. See Contra-indications. Usually, one injection of 5 000-10 000 I.U. Pregnyl, to complete treatment with an FSH-containing preparation. Two to three repeat injections of 1000 to 3000 I.U. each may be given within nine days following ovulation or embryo transfer (for example on day 3, 6 and 9 after ovulation induction). 1000-2000 I.U. Pregnyl, two to three times per week. If the main complaint is subfertility, additional doses of an FSH-containing preparation (75 I.U. FSH) daily or two to three times a week, may be given. This treatment should be continued for at least three months before any improvement in spermatogenesis can be expected. During this treatment testosterone replacement therapy should be suspended. Once achieved, the improvement may sometimes be maintained by hCG alone. 1500 I.U. two to three times a week for at least six months. If necessary, this treatment can be repeated. After addition of the solvent to the freeze-dried substance, the reconstituted Pregnyl solution should be slowly administered intramuscularly or subcutaneously. Reactions at the site of injection, such as bruising, pain, redness, swelling and itching, have been reported with the use of urinary gonadotrophin preparations. Occasionally allergic reactions have been reported, mostly manifesting as pain and/or rash at the injection site. In rare cases generalized rash or fever may occur. Unwanted ovarian hyperstimulation, ovarian hyperstimulation syndrome. Characteristic symptoms of unwanted ovarian hyperstimulation and the ovarian hyperstimulation syndrome are included above, under "Warnings". As far as known this medicine has no influence on alertness and concentration. The acute toxicity of urinary gonadotrophin preparations has been shown to be very low. There are no symptoms of an acute parenteral overdose known in humans. PREGNYL 1500 IU: 2-mL ampoules, marked in the neck with two blue rings and containing a white to almost white dry cake or powder. PREGNYL 5000 IU: 2-mL ampoules, marked in the neck with one yellow ring and containing a white to almost white dry cake or powder. Solvent for Pregnyl: 1-mL ampoules, marked in the neck with one green ring and containing a clear, colourless, aqueous solvent (9 mg sodium chloride in 1 mL water for injection). PREGNYL 1500 IU: 3 x 2-mL ampoules and 3 x 1-mL ampoules of Solvent for Pregnyl containing 0,9% m/v sodium chloride in water for injection, packed in a ply-carton box. PREGNYL 5000 IU: 3 x 2-mL ampoules and 3 x 1-mL ampoules of Solvent for Pregnyl containing 0,9% m/v sodium chloride in water for injection, packed in a ply-carton box. Store in a refrigerator between 2°-8°C. Protect from light. Keep out of reach of children. Click the button below to add the Pregnyl 1500 I.U Chorionic Gonadotrophin 1x1 Ampoul Per Pack / Amp to your wish list.